After turning down an $800 million offer from Emaar Malls PJSC, the Dubai-based online retailer Souq.com signs an agreement to join Amazon. However, the terms of the deal were not disclosed. Amazon now aims the Middle East, managing to succeed where the company behind the world’s biggest shopping center, Emaar Malls PJSC, failed. 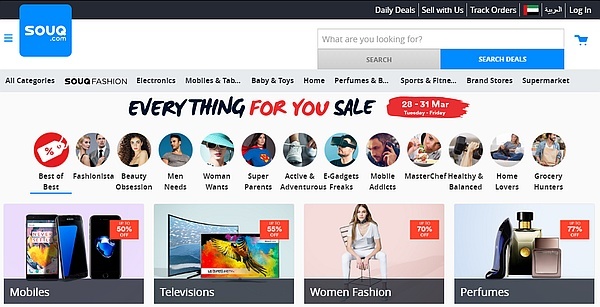 Souq.com is a Dubai-based online retailer that recently rejected a bid of $800 million from Emaar Malls PJSC but has just agreed to join Amazon. According to Russ Grandinetti, Amazon Senior Vice President, International Consumer, "We're looking forward to both learning from and supporting them with Amazon technology and global resources. And together, we’ll work hard to provide the best possible service for millions of customers in the Middle East." Suoq.com currently has over 45 million visits per month, offering 31 product categories that currently feature over 8.4 million items. The brand has localized operations in Egypt, Saudi Arabia, and the UAE. The financial terms of the deal were not disclosed, and the acquisition is expected to close by the end of the year, being subject to customary closing conditions.